I mentioned the thought of compromise in my last entry. For some this is a dreaded word. For others it is simply the realization of the necessary task of reducing the prototype to one’s available space and yet retain a recognizable link to the original. As the track in Eastport is laid out in my own space, I would like to explain the choices that I made during the process. I will start by posting a map that shows the original trackage, and then adjustments that I made to retain the essence of the area. Eastport has two distinct sections to the railroad. 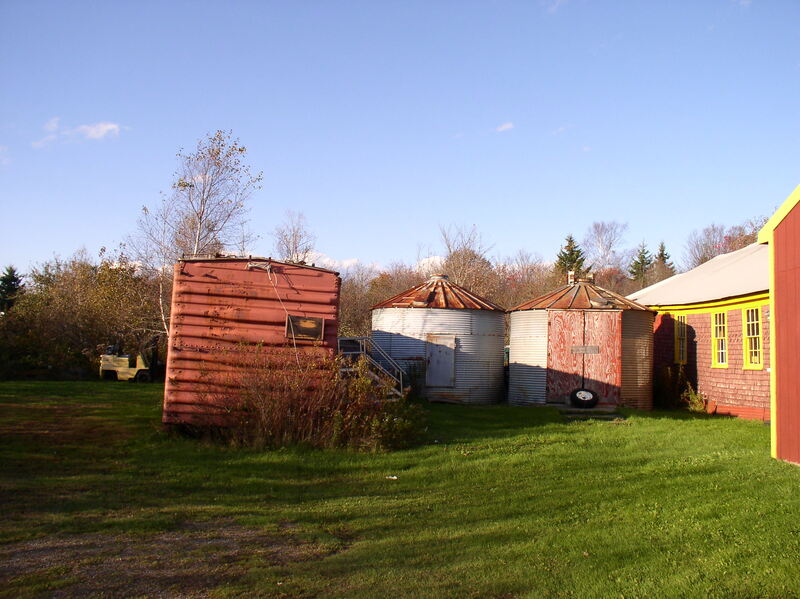 The first is the yard itself along with several pertinent buildings. The second is the harbor area. These two sections are separated by over a mile and a drop in height. Here is the modified map. This map is an overview of the two distinct areas. Where the green line is, a gap of one mile separates the two areas bounded by red. Eastport Yard is a double ended yard where a single track enters the throat from the left. Then at the right hand end the tracks are brought back together, eventually become single once again. In the prototype this single track crosses Key Street and continues on for another mile, dropping in elevation until it reaches the waterfront of the harbor. I simply do not have that kind of space in which to model that feature, yet I want to model both sections. In the model the two adjacent red line boundaries become one resulting in an “L” shaped area.The harbor is roughly 8″ below the yard elevation. The model yard now stops just before the edge of the benchwork. Not well drawn, the blue line to the harbor now starts well before the yard throat and circles around the yard to reach the harbor on the lower level. Each scene will retain the basic elements but the line which joins them normally has been eliminated. I don’t miss this line because it runs in a cut behind some houses and is not all that interesting. This next portion of the map of the yard brings the area up to the date of the model which is late 1960’s. The origin of the map was 1930 and thirty years later the railroad was functioning differently and some buildings were no longer needed. Passenger service had ended eliminating the need for a depot. The freight house and engine house were gone as well.. The storage building next to Raye’s Mustard was combined into an attached “L” to the main structure. Not shown in this map is the new location of the line down to the harbor. The actual benchwork looks like this. Where the bundles of rail lay, this is the approximate location of the turntable. The green foam blocks illustrate the drop in elevation from the yard to Sea Street, which is the road that runs along the waterfront and connects the various piers and canneries. The actual water level is below the street level. The rails also run down Sea Street as far as the American Can building. This final map will give some more detail to the harbor area. Some of the structures shown on this map were gone by the 60’s. Survival of wooden buildings on wood pilings was always tenuous and many were lost due to storms and rot plus eventual disuse. 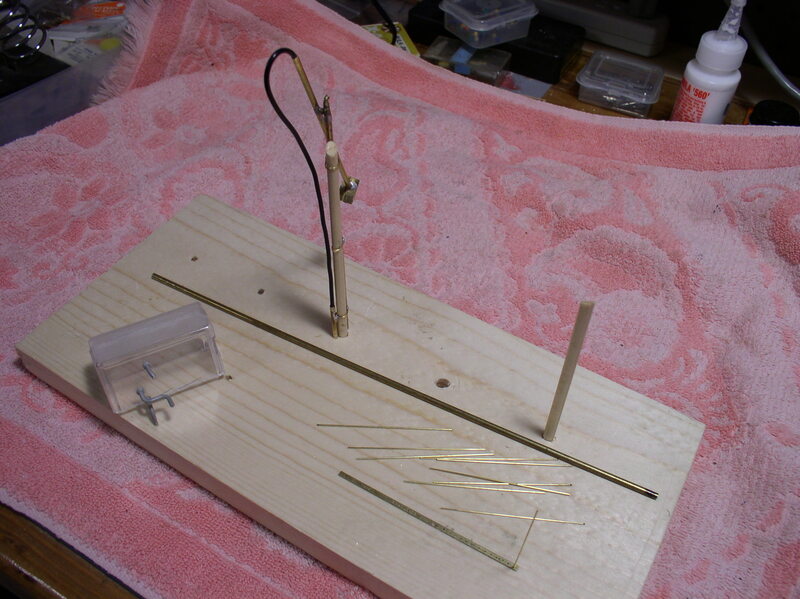 Moral of the story here is that modeling a prototype is always a compromise. It is how we handle it can make or break us. 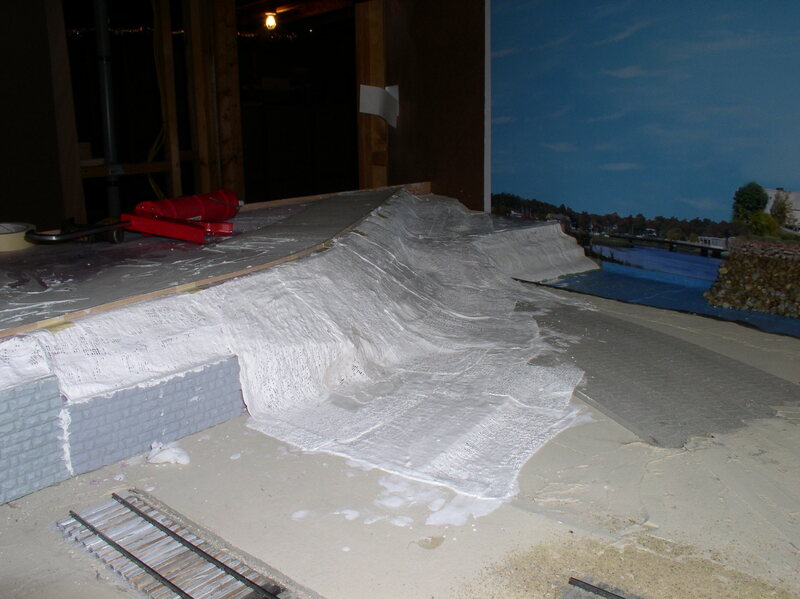 There are two projects going on at the moment, putting down the Homabed roadbed in Eastport and shingling Raye’s Mustard Mill in the model shop. There are no photos as yet showing the completed placement of the roadbed. I’ll try to take some later today or Friday. I would like to explain the compromise I had to make in getting the most out of my space for future operation. I do however have a couple of photos of the shingling project under way. It has been quite a few years since I built structures for my former railroad using simulated wood shingles. Back then I used very thin cedar sheets and cut them into individual shingles. 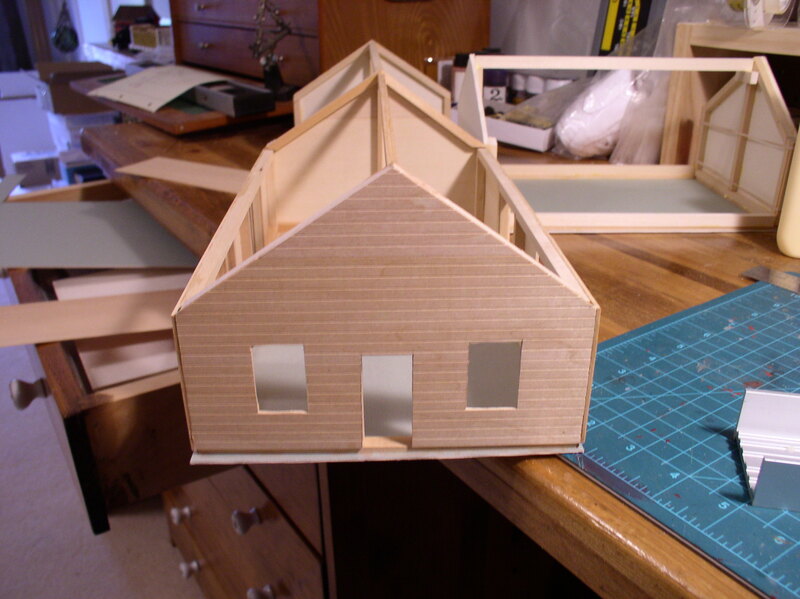 I would put down a thin bead of glue and then pick up the shingles with the sharp point of an Exacto knife and place the shingles into the glue bead. Very tedious work to say the least but nothing beats the appearance. Back then I was only doing building roofs. This time around I am using self adhesive shingle strips from Rusty Stumps. That saves a great deal of time compared to the old method. Study of the photos will reveal I am using scribed basswood as a wall base. The scribing is done at 3/16 spacing. This yields a 9″ reveal dimension, or as we used to say in New England, 9″ to the weather. A dimension between 4″ and 6″ is more normal, but at the distance this building will be viewed from, a little exaggeration will help. The interior blackened area has been sprayed with flat black to keep the interior from showing through the windows. This structure will not be lighted. Even at the 9″ vertical spacing, this mill uses a lot of shingles. The color is rather bright red as yet but I hope to darken it quite a bit during finishing. What doesn’t show is the coat of sanding sealer I put on the basswood to help the adhesive stick better. The wall openings on the front end will be filled with molded doors and windows, mostly from Grandt. 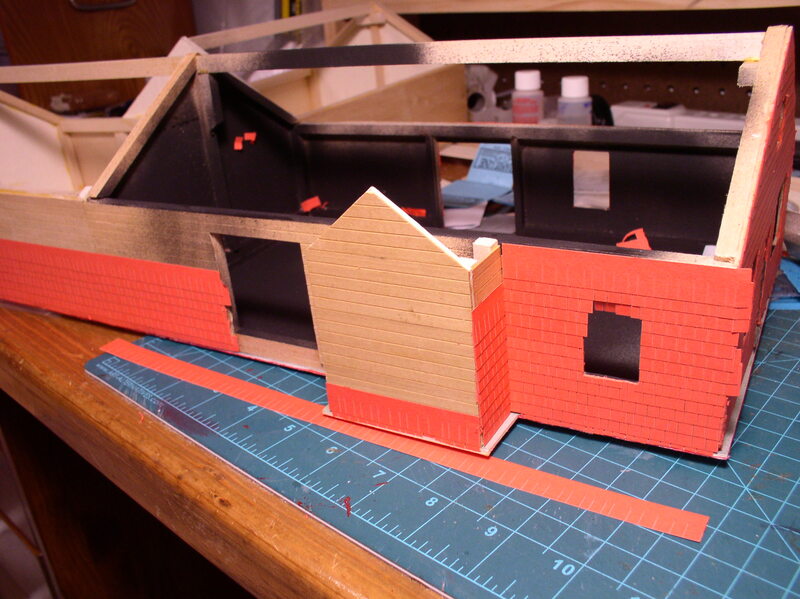 There are some planned sliding doors for the rear areas but these will be built in place right over the shingled siding. The roof will be corrugated aluminum from Northeastern. These panels will be placed over Taskboard sheet which will provide a stiff and stable base. In between thunderstorms today the roadbed crew made progress toward Eastport Yard. I’m pleased with what has been accomplished in a little under a year and a half. Not at all bad for part time labor. Once the placement had been determined for Raye’s Mustard, then I was able to layout the track centerlines for the rest of the yard. You will note a combination of Homabed flexible road bed strips and solid turnout plates. Paper templates of the turnouts have been glued to the plates, but the plates are not glued in place yet. The plates have been outlined with a red marker so that they can be taken up and glued back later. 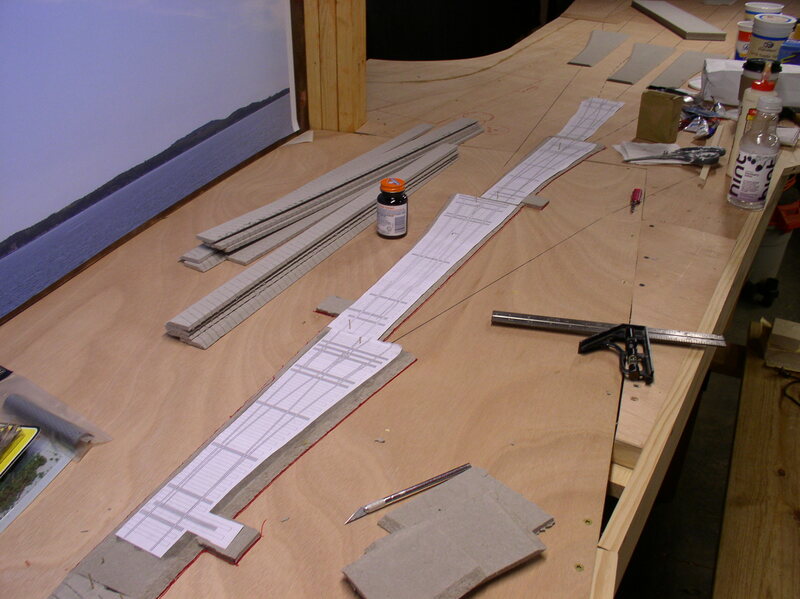 The strips have been glued to the bench surface. 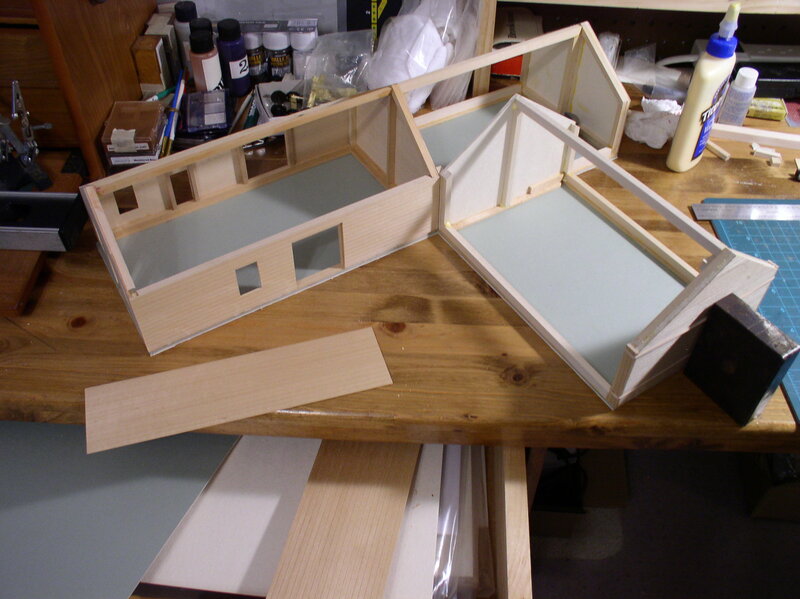 The plates will be taken home to my model shop in the loft and built there.Then they will be brought back to the layout and re-inserted in place. 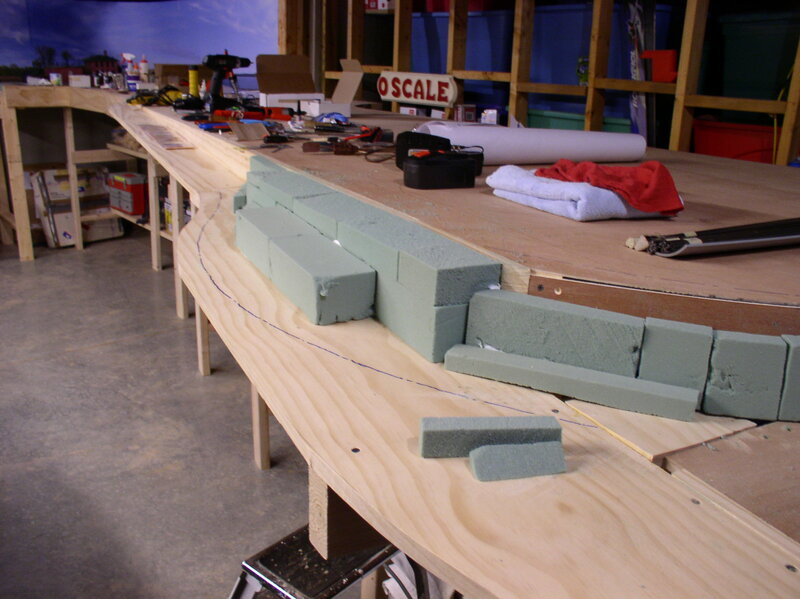 Even though roadbed is being used in the yard, eventually the entire area surrounding the track will be brought level. I have a lot of leftover Homabed pieces for this purpose. Eastport yard near the end of its existence was pretty much grass covered and in places it was hard to see the rails. That is the look I will be attempting in the future and for now I must continually visualize it in order to get the preparation correct.Ties are next. The subject business today has a very interesting history. The company was started in 1900 and moved to it present location in 1903. It was built to service the sardine industry. Many cans of sardines were packed with mustard as a flavor enhancer from early on. J.Raye founded the company using some large stone grinding wheels that he acquired for the purpose. Today mustard is either manufactured by cooking the seeds or by high speed grinding, but not in Eastport. Raye’s mustard is unique in that the wheels turn slow and therefore is a cold grind process. The machinery is operated by an overhead belt system also making it unique. The company today is part manufacturing and part museum. The mustard has turned from being just a sardine filler to gourmet status. There are mixes available from horseradish, to blue berry, to maple, and beyond. Google their site and take a look. 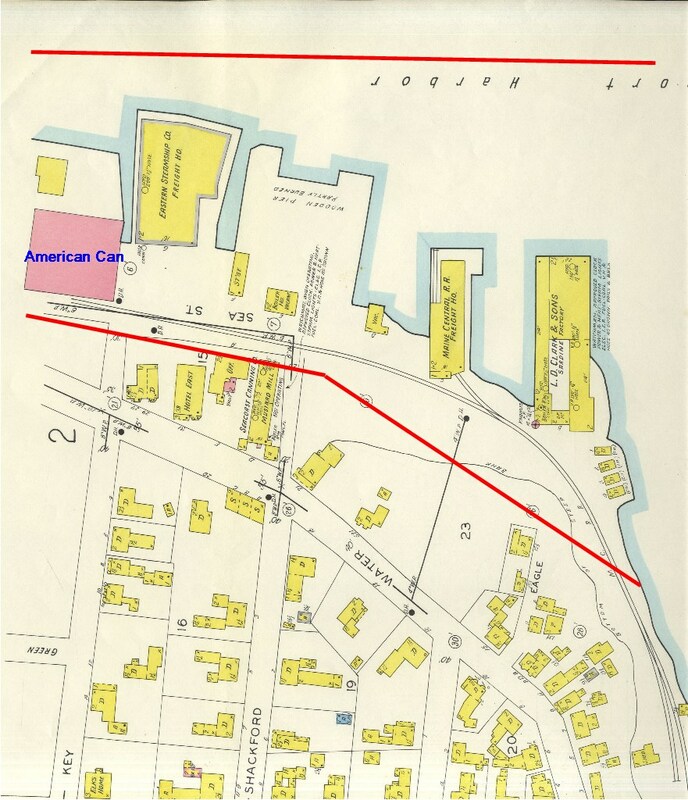 The placement of the company in 1903 was strategic next to the railroad which allowed shipments to other canneries near rail service, the local canneries in Eastport, and the outside world. Acquisition of quality seeds from Saskatchewan was also assisted by rail access. 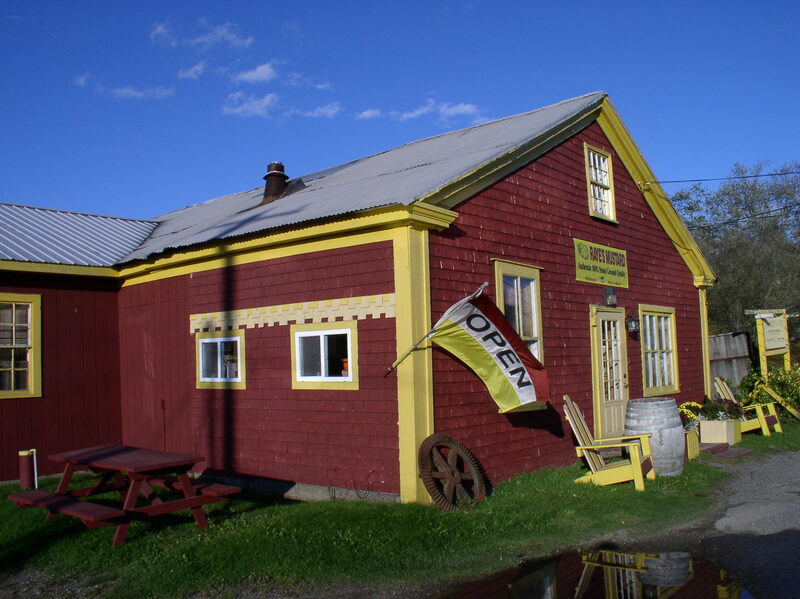 Today the local canneries are gone and so are the MEC rails, but the mill lives on with the tastiest mustard anywhere. The round storage bins in the next photo are for seed storage. For my model of Eastport I realized that I would need the foot print of the mill established as part of the track placement. 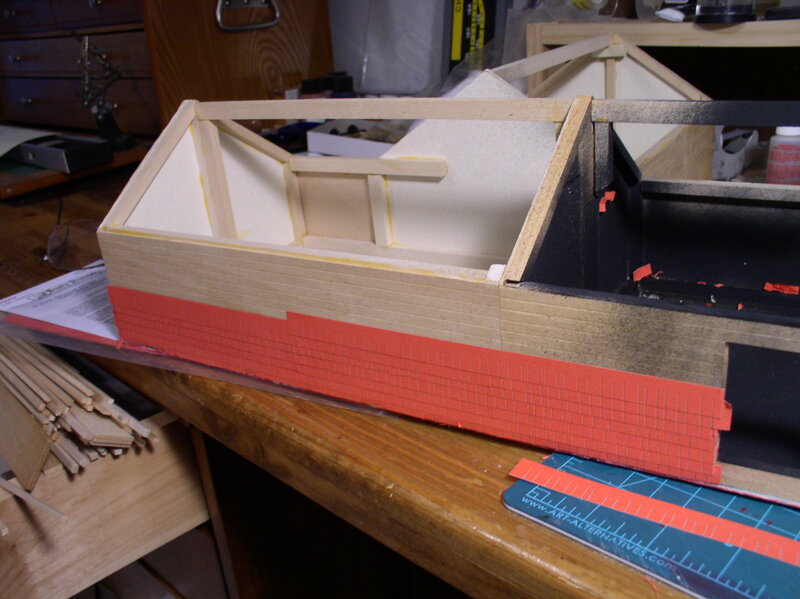 I am approaching Eastport with roadbed and so I started construction of the model mill. 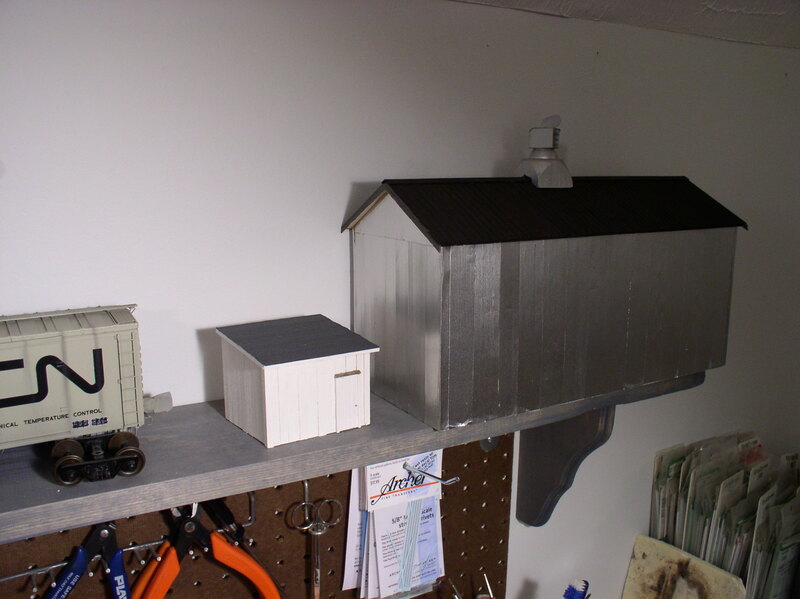 The following photos give an idea of the basic model and its construction.The outside walls are shingled with wood and the roof is corrugated metal. The reefer body in the above photo serves for additional storage. Its location is right on top of the rail line which has long since been removed. I am as far as I need to be for laying out the track placement. 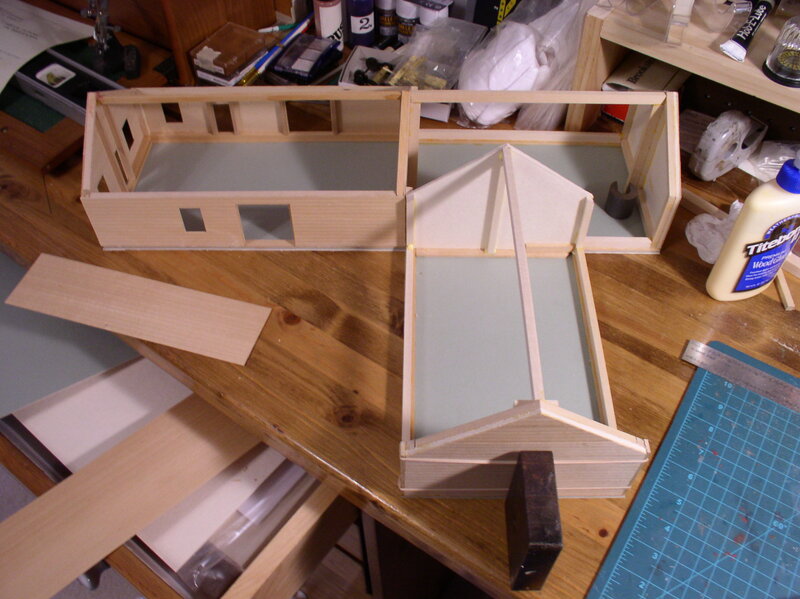 But since there is nothing else scheduled for the model bench at the moment, after I take it over to the layout and mark the floor plan I will probably continue to work on it. I have most of the material on hand for the construction. In the photos you will note scribed bass wood for the sides, but these are sub-sides which will eventually be covered in laser cut shingles by Rusty Stumps. The windows and doors will be a combination of Rusty Stumps and Grandt plus the large double doors will be scratch. The roof material was obtained from Northeastern Scale Lumber. The grain silos will be from RIX Products. I love old belt driven machinery and this mill has its share, but the interior will not be visible and the location too far from the aisle for viewing. So I will pass on the temptation to model it. 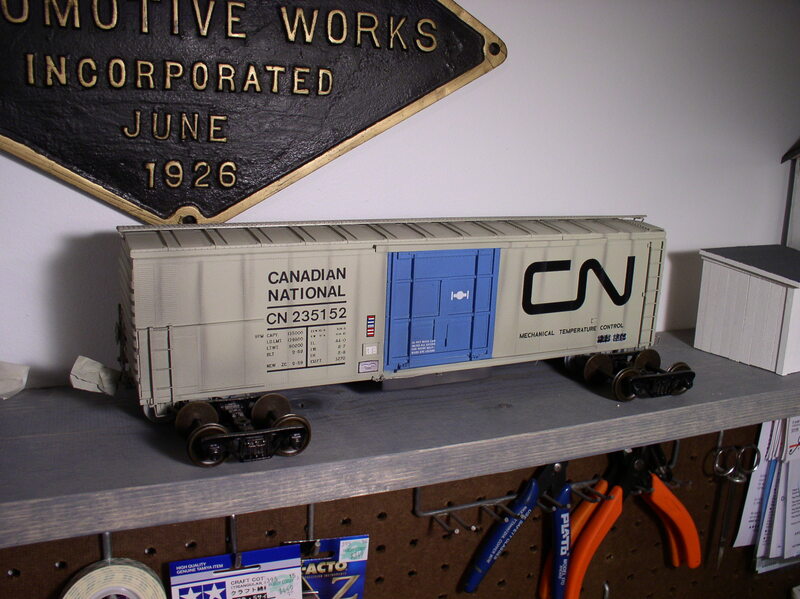 Another part of the model I will pass on is a wood vinegar tank car that used to visit every so often, There are photos of this car in the plant but its use had ended long before my era. That’s it for today’s history and model comments. Well, another month has flown by, yet the progress on the Eastport Branch has been very satisfying. I wasn’t able to be quite as active on the railroad as I would have liked but health issues have now been resolved and things are moving again. Plaster contouring has begun in preparation for initial ground cover. I have also started the installation of the fascia. 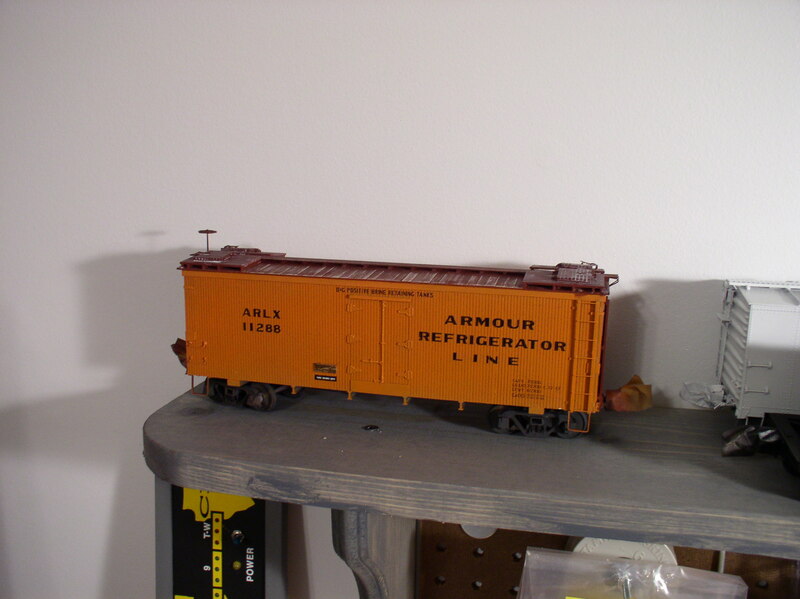 While work on the railroad itself waited I did put in some time in the model shop. The reefer project has reached the stage of reassembly and weathering. Still lots of finicky stuff to do, but coming along. 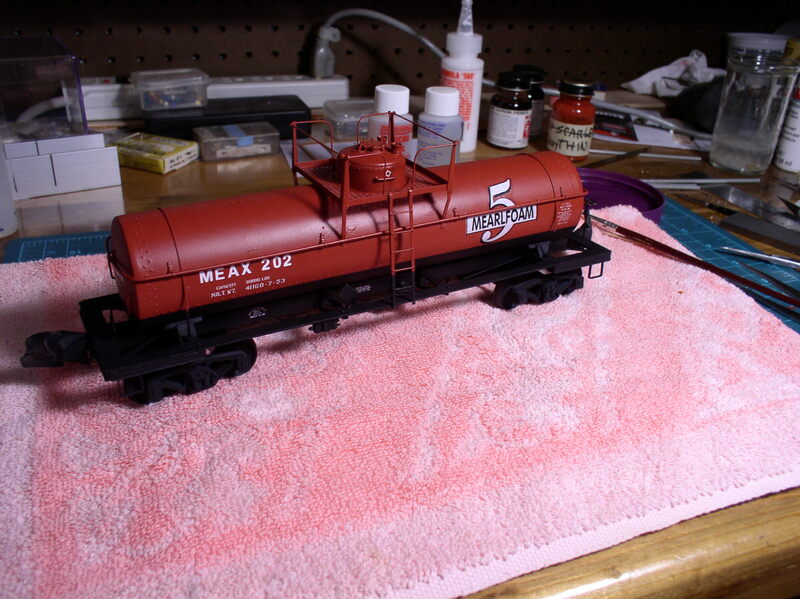 One interesting car project I have been working on is a tank car that was once owned by the Mearl Corporation. Mearl was first noted for the production of iridescent powders for the cosmetic industry that were made from fish scales. Then during WW2 a method of making fire suppressant foam made from fish protein was discovered. The initial part of the compounding was done in Eastport and then shipped as a liquid in tank cars to NJ where the final combination was made. So far no photo has been located, but verbal description of the cars by a former plant manager has resulted in the attempt shown below. As in the reefer situation noted earlier, the discovery of the tank car existence was a surprise that turned up in research. As is often the case, photographers concentrated on the locomotives and unusual cars were missed. Work to assemble various details for Calais Yard has continued. The Engine house is nearing completion along with one of the side sheds. In the next view are several of the specific details. The clear box with the pipes sticking out is the fuel pump that transferred oil from a tank car to the filling hoses via a filter. The strange looking contraption with the angular piping is a flexible sand filler that could be swung over and adjusted to reach the locomotive sand boxes. Also in the photo I have started to make a tell-tale which was located beside the engine house. This warned anyone on a car roof of the Main Street overpass bridge. 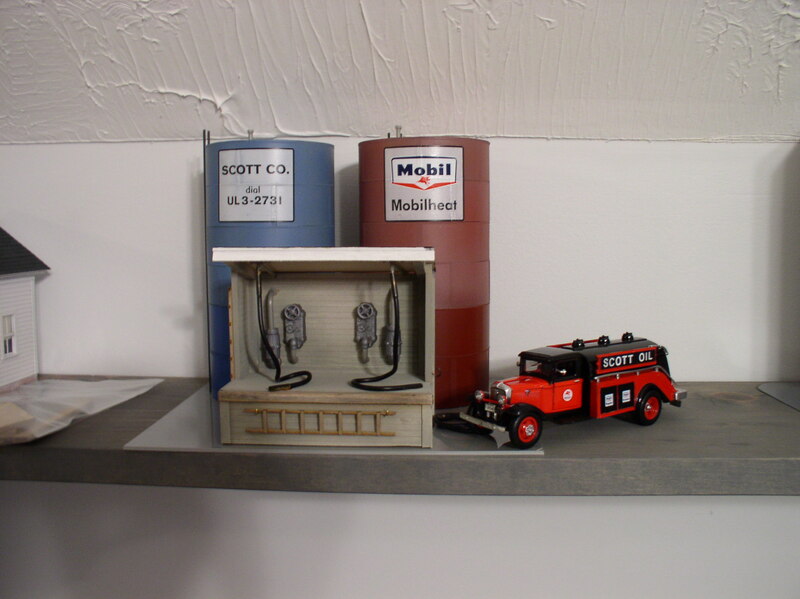 And finally I have completed Bart Scott’s storage tanks and filling station which will be located in Eastport Yard. I’m now enthusiastic about what lies on the April horizon.